Cartonerd: Does it matter if the map is wrong? Does it matter if the map is wrong? Today you had a nice little article online asking 'Olympic Counties: Does it matter where medal-winners come from?'. You even begin with the phrase 'A geographical breakdown of Team GB's Olympic success reveals some areas with more prizes than others'. It's a pleasant enough commentary on social and spatial identity and belonging and the way in which towns and cities across the UK are claiming association with Olympic medalists....and you point out in a very British way the error of most of this with facts about the real place where Andy Murray was born or how Yorkshire is in fact not a single place etc etc. Ollie O'Brien (@oobr) was astute enough to take a screen grad (thanks to him for passing it on to me) and pointed out the first wave of mistakes on Twitter (Aberdeen not being in Aberdeenshire; Plymouth not having a medal, Edinburgh in the wrong place etc). 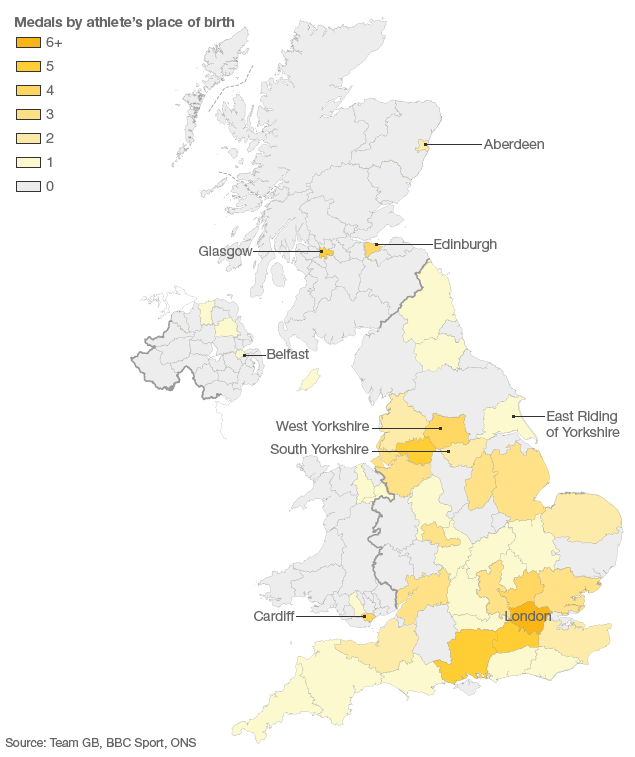 You've gone and done it again...mapped raw numbers using a choropleth (BBC is developing a habit of doing this). Mapping totals in this way is completely spurious. You've got to adjust for the different sized areas and populations (normalise). Yes, London is a big city and Greater London has a population of 8278251 and 10 medal winners. That's 0.12 medals per 100,000 people. Cardiff has a population of 346100 and 4 medal winnesr. That equates to 1.16 medals per 100,000 people. So the population of Greater London is nearly 24 times larger than Cardiff...it's therefore perfectly reasonable to expect (all other things being equal) that more medalists will hail from the Greater London area despite Cardiff actually doing far better in relative terms. The point about the map is that to compare one area's medal haul to another requires you to modify the raw counts precisely to allow readers to compare them on a per capita basis. As it stands your map presents a meaningless distribution. Other than that glaring error... nice colours. Check. Clear labels. Check. All going well so far but wait...this is an article about assigning medal counts to place of birth and yet you assign medals to the Cities of Aberdeen, Glasgow, Edinburgh and Cardiff and others to large counties and that's after citing work from Dr Garner of Aston university whose work makes clear that people's loyalties are much more localised (estates, areas and, at most, a town or city). You've used a nicely inconsistent mix of English county boundaries, Scottish council Areas, Welsh unitary authorities and Northern Irish council areas. What happened to English unitary authorities? In fact what happened to Plymouth...it was shown as a unitary authority on version one without a medal, then it magically disappeared in version 2. Maybe a proportional symbol map centred on cities would have been a better approach to at least be consistent? While we're talking about consistency, are you labeling counties or cities? You label London yet shown the Greater London boundary. So I re-did the map. The map below shows the per-capita distribution on the left and whaddya know...actually London didn't do so well in relative terms. I also fixed the issues with the boundaries so there is at least consistency. And if you still insist on mapping totals, the version on the right maps the raw medal totals as a proportional symbol map. So, BBC, you wrote an article about the importance of place and identity yet failed monumentally in using that most geographical of tools...a map, to illustrate the facts. In so doing you destroy any faith the reader has in your report and for those who don't recognise the errors, you perpetuate misconceptions through erroneous cartography. Does it matter if the map is wrong? Well, yes, particularly in an article about geography, place, spatial identity and where the basis of the discussion is about comparisons between places. PS...Before someone cries foul that I didn't include Northern Ireland or the Isle of Man, Channel Islands or any of the 9 foreign countries that Team GB medalists hail from...I know...I'm sorry...I just didn't have the time or data to go to those lengths and all this blog was supposed to do was make a general point rather than build a perfect replacement. Right on, Kenneth! I see this all over the place and you've stated the problem well and succinctly. I suspect I'll be forwarding this link about once per week.